A busy open evening for people looking into postgraduate study options has been held at Wrexham Glyndŵr University. The evening gave prospective students the chance to sit down and meet lecturers and academics at the university to discuss courses and to meet with current postgraduate and professional students. 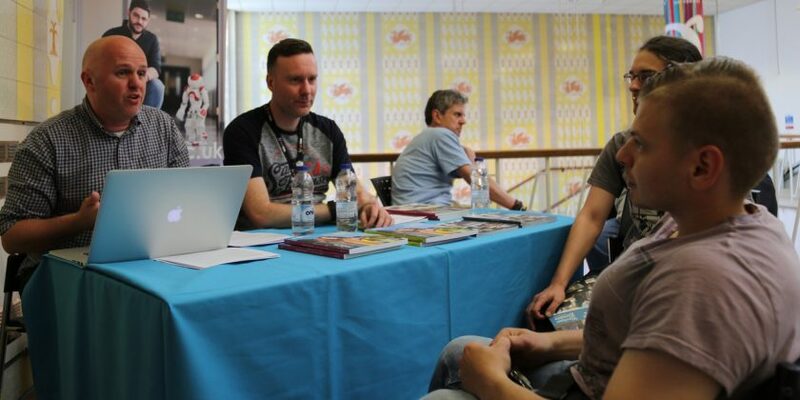 Staff from the student support services teams were also on hand to offer advice during the event – including on how to combine your studies with your career, your wellbeing when you are studying with us – and what help is available for to help fund your studies. Among the scholarships and bursaries on offer is a postgraduate support bursary backed by the Welsh Government for Welsh and EU domiciled students starting either a full-time or part time Master’s Degree this September. Supported by the Welsh Government, Wrexham Glyndŵr University are offering a limited number of fee reductions – these will be in the form of a Support Bursary of £3,400 to each eligible student. Students have to be domiciled in either Wales or the EU and the funding can only be used for MA and MSc courses starting in September 2018. Senior Student Funding and Money Adviser, Beryl Dixon, said: “There are only a limited number of full-time and part-time bursaries available, and applications need to be in by July 30 – so if you are interested in them, you should act fast. Head of Recruitment and Admissions, Julie Cowley, added: “We have a wide range of postgraduate courses available and there was something on offer to suit everyone. “Talking to people during the evening, there were a number of reasons for people wanting to come along – everything from expanding on their current areas of study to developing their professional career with further study. You can find out more about the bursary, and to use Wrexham Glyndŵr University’s interactive tool which shows you how much you could save, here.